Clutch judder and gearbox problems on FIAT, Peugeot, Citroen motorhomes. Updated July 2009. Before you read this SeeRed page, take a few minutes to learn about credit hire companies. You might be glad you did - it could save you thousands of pounds. Please pass on this SeeRed link to all your contacts. The link has been placed at the top of some of the most popular SeeRed pages: January 2011. FIAT Ducato and Peugeot Boxer clutch and gearbox problems on motorhomes - 5 and 6 speed gearbox problems. Note: Most chassis-related problems are reported on FIAT based motorhomes, simply because there are so many more of them than other makes. Until 2008/9 the chassis designs offered by Ford, based on the Transit, were thought a poor alternative to Fiat designs. The most recent Ford chassis is regarded as a vast improvement, and certainly on a par with Fiat's new X250 design. Given the publicity surrounding gearbox problems on the X250, the Transit might be used more widely in future! Traditionally, FIAT gearboxes on motorhomes have been known for their fifth gear problem - in essence, a four speed gearbox was converted to five speeds by adding extra gearwheels to the gearbox, and something inside often fails, apparently because (so some say!) the extra gears are not supported at both ends. Photos and copy text from MMM magazine of March 2007 are here. However, there is now a more worrying feature on the new X250 (X2/50) chassis - manufactured from around 2006. This Sevel chassis is used by the majority of motorhome manufacturers, together with that offered by Peugeot as the 'Boxer'. This is in addition to a number of VOSA recalls, apparently. In common with other manufacturers who seem unwilling to admit to design failures - for example Nissan refuse to admit they have problems with the Turbo units on their X-Trail and Primera models despite numerous component failures - FIAT seemed initially set to try and 'tough it out'. More recently, it has been suggested that the design may be phased out - but not before many thousands of potentially troublesome motorhomes have been sold. These may continue to cause problems for future owners over the next 20 years. The latest developments as of July 2009 are given below. Anyone buying a Fiat/Peugeot/Sevel based motorhome dating from 2006/07/08/09 and maybe into 2010 would be well advised to ascertain if it is one of the potentially affected models. An article from the June 2008 issue of the Caravan Club magazine is reproduced below - one benefit of this club is that its magazine maintains a good degree of independence from manufacturers - it is not dependent upon their advertising revenue. Thus, these and other matters of poor quality design and manufacturing of caravans and motorhomes are frequently aired. An update from the Caravan Club Magazine of July 2009 has been added - and sorry reading it makes too! This webpage is a part of the SeeRed website which has a large caravanning technical section. Internet discussion is on a number of boards - including this one. Clutch judder affected cars well before the days of dual mass flywheels - often the cause was contamination of the linings by oil. Slipping the clutch could produce a smooth take-off but at the expense of increased clutch wear and glazing - which made the problem worse! One key point about motorhome clutches is that they have a hard life because the vehicles are always loaded to near their design capacity - unlike commercial vans based on the same chassis types. Two youtube videos showing DMF clutches are here: there are many other examples. However, failure of a DMF cannot reasonably explain problems in these new motorhomes - the problem was initially thought far more likely to be an undersized clutch - or some other aspect of the drive train that was inadequate. As of early 2009 there are three 'fixes' available. A software upgrade can alter the torque characteristics of the engine so rendering judder a little less likely. If this doesn't work to the owner's satisfaction, a revised engine mounting can be installed. Some people find this makes matters better, some worse and some no difference! Finally, Peugeot then developed a new set of gearwheels to reduce the ratio of the reverse gear. Fitting these new gearwheels entails stripping or replacing the gearbox - a lengthy and risky job given that most garages would probably be incapable of reassembling it to factory standards. What a shambles!! It seems to be unknown whether (and if so from what date) new gearboxes will be produced with the old set of gearwheels or with the revised and more satisfactory lower reverse ratio. The whole problem appears to be the result of designing the gearbox with the reverse gear ratio too high. For many owners - those who never reverse up a steep incline - ownership of one of these early X2/50 models may never be a problem. For other owners, it can result in many thousands of pounds in repair bills. And of course, many motorhome salesmen feign ignorance of the issue! Some have even told me it affected only tag axle vehicles. The comment below (in blue) relating to the 2.3 diesel acknowledges that it was apparently developed specifically for motorhome applications. In their sales display boards (to be seen at many dealerships) Fiat proudly expand upon the many special features of their new 'motorhome' chassis, including 'special gearbox ratios'. What a pity they seem to have got them wrong, and there is apparently not room inside the gearbox for a really low reverse gear. In the old days (50 years ago) most cars had a lower (ratio) reverse gear than first forward gear - precisely so that people could go slowly backwards up steep inclines without slipping the clutch too much and (in those days) wearing out the carbon release bearing. Progress seems to have dictated that this lesson of history be forgotten! Ducato shares the same basic design as Peugeots Boxer and Citroëns Relay, but the 2.3-litre diesel is unique to the Fiat. Reverse juddering has also affected Boxer, however, and Peugeot has come up with a different way of solving it. Half-a-dozen or so six-speed boxes have been swapped so far and Boxer owners are being encouraged to contact their local Peugeot dealer if they believe they have a problem. 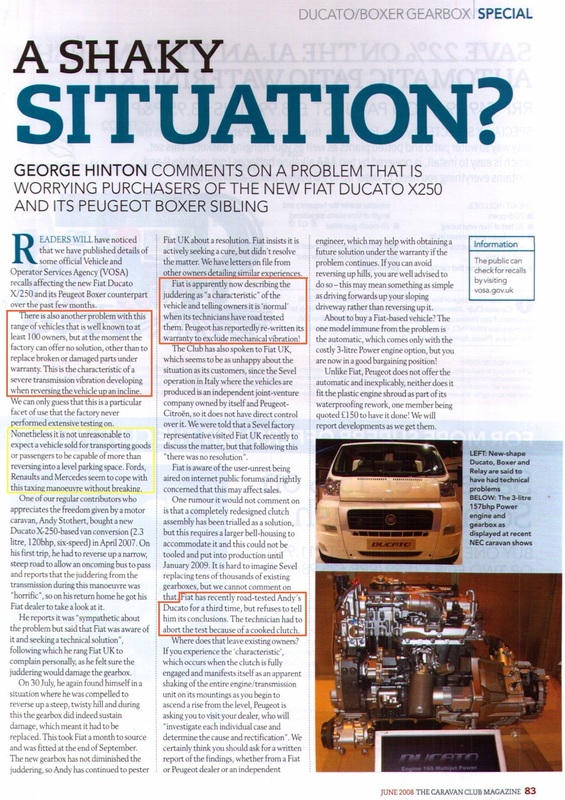 An update on the Fiat gearbox judder problem, scanned from the Caravan Club magazine of July 2009. The author, Andy Stothert, purchased a faulty Fiat based motorhome and ever since has been campaigning for a 'proper' solution to his gearbox juddering problem. If Mr Stothert had not been a motoring journalist we may never have heard of this issue - or rather, Fiat might have got away with it. Unfortunately, a 'proper solution' seems not to be possible simply because there is no room in the gearbox casting for a large enough gearwheel to reduce the reverse ratio to a sensible value. All other 'cures' are insubstantial in that they may satisfy some owners (and Fiat may claim the vehicle has been 'cured') but when it is sold to another user who may have more onerous reversing requirements, juddering and even destruction of the gearbox may again become an issue. Fiat may decline at that later date to contribute to necessary repairs because the vehicle may then be out of warranty! Anyone who purchases a Fiat/Peugeot based motorhome with the X250 chassis should be aware both that the gearbox may be damaged (even if it has not yet broken up) owing to juddering. Even if the previous owner has reported quite honestly that he has never had a problem with the vehicle, future expense cannot be ruled out, if only because the degree of clutch control exercised can differ from driver to driver. Earlier problems with Fiat 5 speed gearboxes.